UNITE HERE has a proud history of improving working conditions, wages, and benefits across Canada and the US through successful organizing. The union is known throughout the labour movement for innovative and effective campaigns utilizing corporate campaign strategies and impressive grassroots mobilization of workers and community allies. 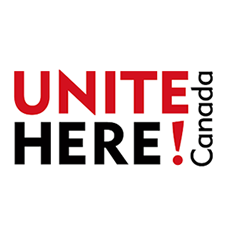 Through organizing, UNITE HERE members have made apparel jobs in Montreal, hotel housekeeping jobs in Toronto and hundreds of thousands of other traditionally low-wage jobs into good, family-sustaining, middle class jobs. UNITE HERE traces its history back over one hundred years in North America and boasts a diverse, majority female membership. UNITE (formerly the Union of Needletrades, Industrial and Textile Employees) and HERE (Hotel Employees and Restaurant Employees International Union) merged on July 8, 2004 to form UNITE HERE.